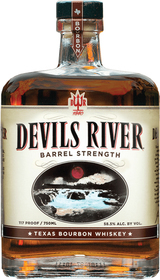 Devils River Barrel Strength Bourbon pays homage to how bourbon was originally enjoyed. When you drink barrel proof bourbon, you're enjoying whiskey the way the pioneers enjoyed it as bourbon was always served at full strength … straight from the barrel. A bold, smooth taste that develops on the palate. Our Barrel Strength Bourbon's flavor is amplified with even stronger hints of oak, honey and caramel followed by some peppery spice.